The global cooling towers market is expected to face significant rise in the market owing to its increasing usage in buildings for removing heat from heating, ventilating, and air conditioning systems. It is extensively used in industrial settings for attaining energy efficiency and maintaining temperature of chillers. Cooling towers find significant usage in power generation plant, food processing, gas, oil, and chemical industries. 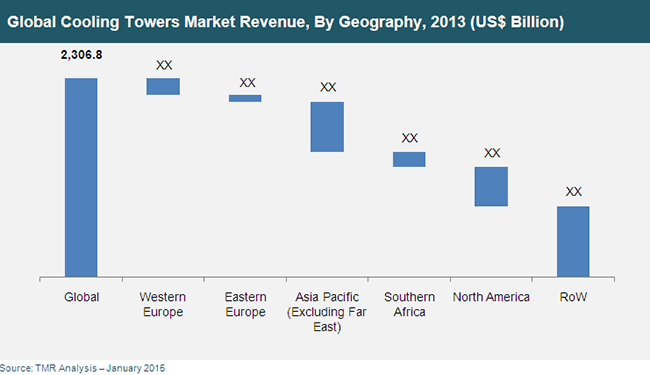 Increasing usage of cooling towers are boosting the market in various parts of the globe. Cooling towers are also used substantially as it comes in various sizes, sufficing different demands. The global cooling towers market is expected to rise a healthy CAGR of 4.70% during the forecast period of 2014 to 2020. The global market was worth US$ 2.3 bn during 2013 and is expected to attain a valuation of US$ 3.1 bn by the end of 2020. The global cooling towers market is segmented by type into closed circuit cooling towers and open cooling towers. The more common type of cooling towers across the globe is open type. The open type towers are rising in demand and are expected to dominate the market due to its efficiency, simple design, and economical advantages. Whereas closed circuit cooling towers provide minimum water evaporation along with lesser contamination. These features help in reducing water loss during the cooling process. However, closed cooling towers are offering these features at higher or expensive prices. These factors are restraining the closed cooling tower circuits’ growth resulting in lesser adoption of the same. Only economies not facing cost constrains and having ample amount of fresh water are consuming closed cooling towers. The global cooling towers market is segmented according to exchange method into plume abetments/hybrid, wet/evaporative, and dry cooling towers. Among these, dry cooling towers are anticipated to rise at a significant rate because it has higher average of life expectancy and less investment in maintenance. Dry cooling method utilizes natural air from the atmosphere rather than water for cooling. It does not need exchangers for mid heating. This method is equivalent to radiator as radiator also uses atmospheric air for cooling purpose. Hybrid cooling towers incorporate dry cooling as well as evaporative cooling units at the end points of open or closed cooling tower circuits. Hybrid cooling towers saves around 50% of the water compared to wet cooling towers. Therefore, hybrid cooling towers is facing wider adoption and is anticipated to rise in demand during the forecast period. The global cooling towers market is segmented by application into manufacturing industry, power generation utilities, and air conditioning. Among these, industrial units are facing rise in the market owing to its usage in industrial units for bringing down temperature during power heavy operations. The industrial units focused on maintaining congenial standards are increasingly consuming cooling towers for their premises. Rise in number of urban projects aiming construction of industrial areas are boosting the demand for the same. Increasing number of power projects and increasing demand for electricity is boosting the market for power generation utilities. Commercial as well as residential building are equipped with central cooling system thus, bolstering the demand for air conditioning. The global cooling towers market is spread across various regions such as Europe, Asia Pacific, North America, Latin America, and Middle East & Africa. Among these, North America is leading the global market and is anticipated to dominate the global market in the coming years. Rise in this region is mainly due to technological advancement and rise in disposable income because this region is economically advanced. These factors are encouraging manufacturers to invest in this region. The leading players operating in the global cooling towers market are SPIG S.p.A. Hamon Group (Esindus S.A.), Paharpur Cooling Towers Ltd., and SPX Corporation. Cooling tower is a heat rejection device that removes the unwanted heat from the cooling system in the atmosphere. Cooling tower is used to cool the water circulating in the cooling system. The circulating water is cooled either by evaporation or by blowing air to the warm water. Cooling towers are widely used in different industries such as chemical, oil and gas, food processing, power generation plants and other air-conditioning applications. Cooling towers help in saving large amount of water as it cools and circulates water continuously throughout the cooling system. Rising need for energy efficient cooling towers across different industries is the major factor driving the cooling towers market globally. Furthermore, growing manufacturing industry and large number of upcoming power plant projects are further to bolster the demand for cooling towers during the forecast period. The cooling towers market is segmented based on the types of cooling towers, heat transfer method, applications and geographic regions. The basic types of cooling towers are open cooling towers and closed circuit cooling towers. Different heat transfer methods used in cooling towers are evaporative cooling, dry cooling and hybrid (a combination of evaporative and dry cooling method) cooling method. The cooling towers market is segmented based on its applications as Heating, ventilation, and air conditioning (HVAC), power generation utilities and manufacturing industries. On the basis of geographic regions, cooling towers market is segmented into Western Europe, Eastern Europe, Asia Pacific excluding Far East, Southern Africa, North America and Rest of the World (RoW). RoW comprises South America, Middle East, North Africa and Far East. The research report on the cooling towers market provides a detailed analysis of types and heat transfer methods used in these towers and helps in understanding the major driving forces of cooling towers in different industries. It also provides analysis of the applications of cooling towers market for the next five years. The report includes extensive analysis of the industry drivers, restraints, market trends and market structure. The market study provides comprehensive assessment of stakeholder strategies and imperatives for succeeding in the business. The report segregates cooling towers market based on heat transfer methods used in cooling towers and different geographic regions. The report includes a detailed analysis of the prevalent market situation, company profiles and industry trends of the cooling towers used across different industrial and commercial applications. The detailed value chain analysis helps the market competitors to formulate their business strategies at every stage of their business. Moreover, the market estimates have been analyzed by keeping in mind the several factors which affect the market including but not limited to technological, economical, social, environmental and legal. The key players of cooling towers market have been profiled with a focus on competitive details such as company and financial overview, business strategies and their recent developments. The players profiled in this report include GEA Heat Exchangers Group, Baltimore Aircoil Company, SPIG S.p.A., Hamon Group (Esindus S.A.), SPX Corporation, FANS, a.s., EVAPCO-BLCT Dry Cooling, Inc. (Evapco, Inc.), Paharpur Cooling Towers Ltd., Liang Chi Industry Company Cooling Tower Depot, Inc., Delta Cooling Towers, Inc., Torraval Cooling S.L., Kimre, Inc., OOO TMIM, BROTEP-ECO, Cenk Endüstri Tesisleri Ä°malat ve Taahhüt A.Åž., EvapTech, Inc., and Changzhou Kwell Cooling Equipment Co., Ltd.